I was a bit late to the party when it came to liking Jane Eyre, by Charlotte Brontë. I somehow managed to graduate high school, college, and grad school without ever having read it. When I finally read it in my mid-30s (yay, book club! ), I absolutely fell in love, to the point where I now dive for books that relate somehow to the original; The Eyre Affair, by Jasper Fforde, and The Madwoman Upstairs, by Catherine Lowell, come immediately to mind. One thing I never really did get about the original, however, was Mr. Rochester. 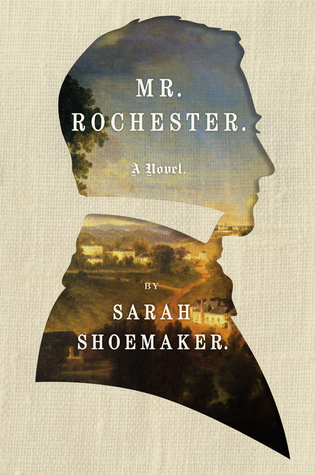 Enter Mr. Rochester, by Sarah Shoemaker, a novel written as the memoir of the life of Mr. Rochester himself. Shoemaker treats him as a whole person, rather than beginning her story when Jane Eyre enters Rochester’s life. The novel begins with Edward Rochester’s early childhood and progresses through his educational experience, eventually coming up to owning a sugar plantation in Jamaica and his ultimate return to England. Throughout the book, Rochester’s complicated, even tortured, relationships with his father and his elder brother inform his choices and help determine the man Rochester will eventually become. Writing a book for which most (if not all) readers know the ending already must be an incredibly daunting task for an author. At least it would be for me. But Shoemaker is more than up to the challenge. She finds ways to explain even Rochester’s most bizarre behaviors in ways that are understandable to the modern reader, if not always admirable to 21st century eyes. I so enjoyed getting to spend more time with this mysterious character, and seeing how Shoemaker would justify his actions and decisions. This book is an absolute must read for fans of Jane Eyre! For one hundred seventy years, Edward Fairfax Rochester has stood as one of literature's most romantic, most complex, and most mysterious heroes. Sometimes haughty, sometimes tender-professing his love for Jane Eyre in one breath and denying it in the next-Mr. Rochester has for generations mesmerized, beguiled, and, yes, baffled fans of Charlotte Brontë's masterpiece. But his own story has never been told. Now, out of Sarah Shoemaker's rich and vibrant imagination, springs Edward: a vulnerable, brilliant, complicated man whom we first meet as a motherless, lonely little boy roaming the corridors and stable yards of Thornfield Hall. On the morning of Edward's eighth birthday, his father issues a decree: He is to be sent away to get an education, exiled from Thornfield and all he ever loved. As the determined young Edward begins his journey across England, making friends and enemies along the way, a series of eccentric mentors teach him more than he might have wished about the ways of the men-and women-who will someday be his peers. But much as he longs to be accepted-and to return to the home where he was born-his father has made clear that Thornfield is reserved for his older brother, Rowland, and that Edward's inheritance lies instead on the warm, languid shores of faraway Jamaica. That island, however, holds secrets of its own, and not long after his arrival, Edward finds himself entangled in morally dubious business dealings and a passionate, whirlwind love affair with the town's ravishing heiress, Antoinetta Bertha Mason. Eventually, after a devastating betrayal, Edward must return to England with his increasingly unstable wife to take over as master of Thornfield. And it is there, on a twilight ride, that he meets the stubborn, plain, young governess who will teach him how to love again. It is impossible not to watch enthralled as this tender-hearted child grows into the tormented hero Brontë immortalized-and as Jane surprises them both by stealing his heart. Mr. Rochester is a great, sweeping, classic coming-of-age story, and a stirring tale of adventure, romance, and deceit. Faithful in every particular to Brontë's original yet full of unexpected twists and riveting behind-the-scenes drama, this novel will completely, deliciously, and forever change how we read and remember Jane Eyre. Beautiful review...you've convinced me that I've just got to read this one. I would like to read it, too.